I imagine there's other JVM developers with similar questions, so I figured I'd publish my response for all to see. JHipster may have a smaller community than Grails, but remember that it's built on Spring Boot and AngularJS. Both have huge communities. In fact, Grails 3 is built on Spring Boot, just like JHipster. Even though JHipster generates your code in Java, there's nothing preventing you from writing your code in Groovy or Scala. I dig JHipster, but I've also worked with AngularJS and Spring Boot for a couple years. The fact that someone put these technologies together and makes it easy to work with them is awesome. 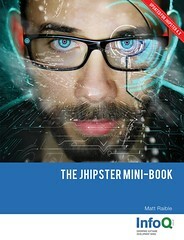 I like JHipster so much, I decided to write a book on it. I hope to finish it in the next couple months and have it published in the fall. It'll be a free download from InfoQ. Learn more at http://www.jhipster-book.com. Yes, I'm probably a bit biased since I'm writing a JHipster book. However, it's been easy for me to introduce and use Spring Boot at my last few clients. They were already using Spring, so the transition to using a Spring simplifier was a no-brainer. I haven't had as much luck getting clients to adopt Grails, even though I've suggested it. That could change now that it's based on Spring Boot. What's your experience? Would you recommend Grails + Angular over JHipster? If so, why?